Head lice, Pediculus humanus capitas, are small, wingless, parasitic insects. They live on people's heads (or sometimes their eyebrows or facial hair), and feed on our blood. They even lay their eggs on our heads by cementing them to individual hairs. Head lice would happily spend their entire lives living on our heads, if they had their way. Although most commonly encountered among children of pre-school or elementary school-age, head lice can infest anyone, of any age, of any race, and of any socioeconomic background. Having head lice is not a sign of being "dirty." Anyone can get head lice. Head lice are most commonly spread from an infested person to a non-infested person by close physical contact or by sharing of hats and other clothing. They cannot jump, hop, or fly from one person to another. They can, however, crawl from an infested person's head to another person's head. This is a common way that they spread between children in schools and day care centers when children hug, play, and roughhouse with each other. Head lice can also fall or crawl from a person's head onto furnishings or carpeting, and wait there for another head to infest; or crawl from one person's clothing to another when the clothing items are hung next to each other. This is very common schools, especially in the winter, when children's hooded jackets are hung next to each other on hooks in a closet or wardrobe. 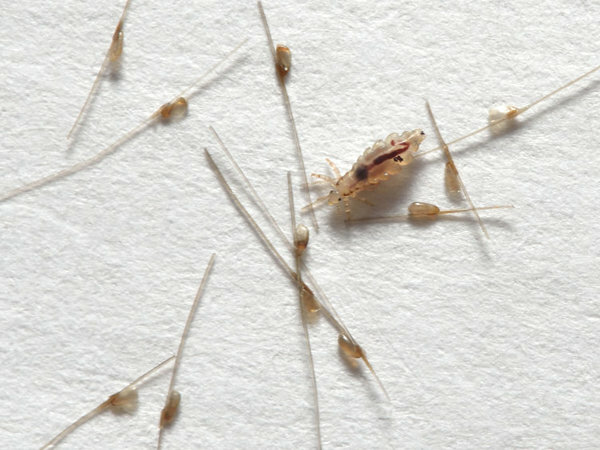 Head lice begin their lives as eggs, often called nits, that are attached to individual hairs. They are attached on the shaft of hair very close to the scalp using a strong cement that the female louse secretes. Most louse-control shampoos contain special detergents or enzymes specifically formulated to dissolve this glue and loosen the eggs. Adult female head lice can lay as many as eight eggs per day. The nits hatch in about a week, beginning a rapid period of gradual metamorphosis through which they will pass through three nymphal stages on their way to adulthood. 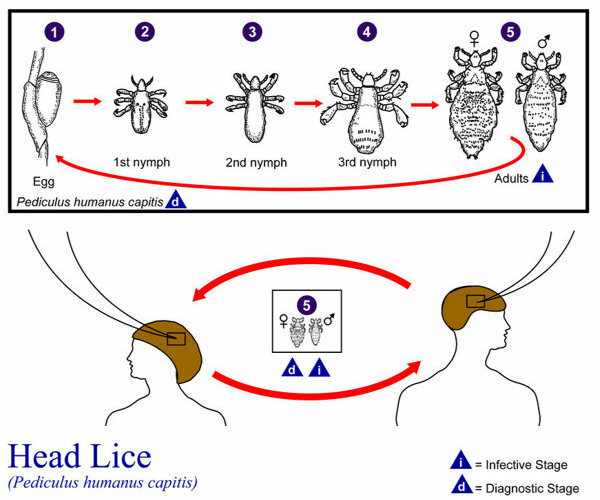 Immature head lice must feed on blood during each stage of their lives to survive and move on to the next stage. They usually reach maturity in about 9 to 12 days after hatching. During this period, immature lice may crawl or fall from one head to another, but typically they don't wander far from where they were born. It's a myth that lice "look for another head" to infest. They're not migratory insects. If they happen to fall or crawl from one head to another, it's simply by chance. They don't "look for" other people to infest unless they've already fallen off someone's head, in which case they simply crawl onto the next head that they happen to come across. As mentioned, head lice reach maturity in 9 to 12 days. They usually live for a month or so as adults. An adult female head louse can lay eight or so eggs a day, or as many as 250 in her lifetime; so if untreated, a head lice infestation can grow very rapidly. Having head lice can be very emotionally distressing, especially to children, who may be shunned or subjected to cruel teasing by other children if their condition is discovered. When dealing with children (and others) who have head lice, sensitivity and kindness are important. Head lice have not been shown to spread any serious human diseases. But they do cause localized itching and swelling, which can lead to infections when the afflicted person scratches the irritated areas and breaks the skin. Some people also may experience localized allergic reactions to head louse bites. Please note that although head lice have not been shown to transmit serious diseases, the same cannot be said of body lice, Pediculus Humanus corporis, which are important vectors of typhus. Very often, parents become aware that their children have head lice when informed by a school nurse that their child or another child in their child's class has head lice. Other signs include scratching, soreness, or irritation of the scalp. When a person is suspected of having head lice, they should be thoroughly examined for lice and nits. Using the fingertips, gently and methodically spread the hairs apart and look for the insects themselves, bite marks on the scalp, or nits attached to the hairs. Pay special attention to the areas near the back of the neck and around the ears. Nits are usually attached very close to the scalp; but since hair grows, you may find nit "shells" farther out along the hairs. 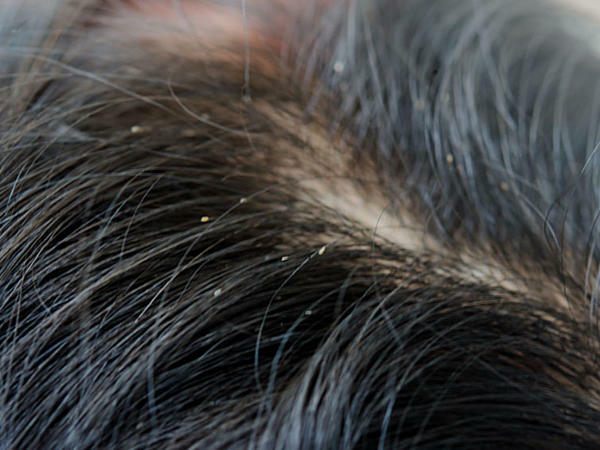 Nits may sometimes be mistaken for dandruff; but unlike dandruff, nits are cemented to individual hairs and don't easily shake off. If a few nits are found, but no adult lice, you may be able to avoid a full-blown louse infestation by washing the person's hair with warm water and ordinary shampoo, then letting the shampoo sit for a while before rinsing it out and using a head lice removal comb to remove the nits. Then wash and rinse the person's hair again and re-examine their head. If no lice or nits are found, you may have avoided a lice infestation.